Some people thought it was crazy to attempt to cloth diaper two children, but it's been a lot easier than I suspected it would be. We're still using our sort-of hybrid system I described last year which includes cloth diapers during the day, and a disposable at night -- for both girls. For wipes, we use cloth (little fleece rectangles) with a homemade wipe solution (baby oil, baby wash, and water) for #1 and disposables for #2. Rounding out our "half and half method" is our diaper pail set up -- one disposable diaper pail, and one cloth diaper pail. It might seem crazy and/or redundant, but this works well for us and I can't tell you how much money we've saved not having to buy case after case of disposable diapers. We don't use a sprayer, but have opted instead for flushable liners. I do diaper laundry once every 3 days and use Rockin' Green detergent. And the middle drawer includes the Bum Genius 3.0/4.0 and our disposables -- Luvs Size 4 (and some miscellaneous baby outfits). A few of the diapers have emerged as the best because they fit both girls so perfectly without necessitating any changes to the diaper settings or stuffing levels. One of those is our Kung Poo. Kung Poo Diapers is a new company in the cloth diaper world. Their diapers are manufactured here in the U.S. and are sold individually, or in packs of 12 or 24. The one-size-fits-all pocket diapers have snap down rows so they will fit from birth until potty training. The diapers also boast a "smart sleeve" that has openings on both ends, which contains the microfiber insert. The diapers come in an variety of colors (or belts - ha!) We received the "black belt". I thought this would make a wonderful addition to our stash since the majority of our diapers are pastels or prints. Carina in the "Black Belt"
Okay seriously how can you see that label on the bum and not laugh? The edge of the insert is threaded with color so it's easy to match up after washing. Since I can't figure out which of our inserts go with which diapers for the rest of our stash, this is clever! Aurelia in the "Black Belt"
The diapers are 100% Polyester with a soft Alova Suede Cloth inner lining and each comes with a Microfiber insert. We haven't had a single leak or blowout and we've been using it on both girls since New Years' (yeah, I'm a bit late on this review). I've also been washing and drying it (in the dryer on low -- I'm lazy) and the insert is still fluffy and absorbent. This is one of the few diapers I can dry quickly and use right away instead of line drying. At only $9.95 per diaper, Kung Poo are the cheapest diapers that work well for us, and additional inserts are only $1.95. 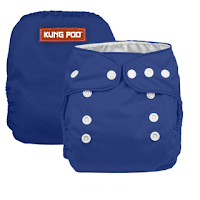 If/when we determine we need additional cloth diapers, I WILL be purchasing them from Kung Poo. Kung Poo also offers free shipping on every order, and has a 30 Day Risk Free Guarantee. Kung Poo Diapers is offering one of my readers the diaper of their choice. This is a Rafflecopter giveaway. Click "Read More" below and then follow the instructions on the widget. Make sure to click "Enter!" after you complete each entry. All currents count! The giveaway is open to residents of the US only and ends at 11:59 PM EST on Saturday, April 13th. The first entry is mandatory - Visit Kung Poo and tell me which color -- er...belt -- you like best! Once you complete this entry, the widget will give you the option of completing the rest. Complete more steps for more chances to win!